Rain put a dampener on an impassioned run chase by Yorkshire with England stars Joe Root and Jonny Bairstow just starting their contributions. Just nine overs into their response, Yorkshire were three wickets down and leading by just one run according to Messrs Duckworth and Lewis. Conveniently, it was at this point that the umpires decided that was hard enough for the players come off the field. After almost an hour of rain, the announcement came over the PA system that the match had been abandoned and Yorkshire had won by one run. 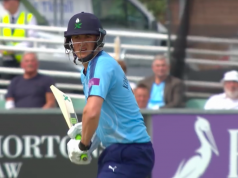 Derbyshire had posted 154-9 in their 20 overs, with Matt Critchley being dismissed with the last ball of the innings – bowled by Tim Bresnan – for 10 and leaving the Yorkshire bowler with the best figures of the lot: 3-22 from three overs. Shiv Thakor was the main man of the Falcons’ innings with a score of 30 from 26. 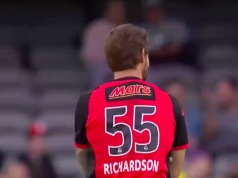 There were a few dicey chances in there, but on the whole he managed to remain a constant while others tossed their wickets to one side like it was something not required for success. 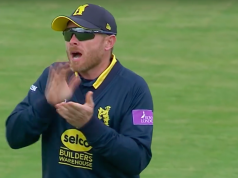 Some good bowling and even better fielding – generally – by Yorkshire kept the Derbyshire innings limited, with Thakor top-scoring and the only men to challenge him were Jimmy Neesham and Alex Hughes who clocked 29 and 23 respectively. Neesham’s innings did manage to inject some spark into the otherwise mediocre batting, as he struck 29 from 23 with three fours and one maximum but found the hands of Gary Ballance off Liam Plunkett’s third delivery of the match. The only blemish on Yorkshire’s fielding card was a spilled chance by Ballance to remove Thakor when he was on just 11. When it came to Derbyshire’s turn with the ball it started well – six runs came from the first over with Adam Lyth managing to strike one four. There were also plenty of up-ish balls struck by the two Yorkshire openers, but into areas where no fielder stood. A stroke of genius – or possibly luck, depending which side you’re standing on – came for Derbyshire when Root struck an Alex Hughes delivery back down the wicket and the bowler stuck his paw out and clipped the ball onto the stumps, removing stand-in captain Kane Williamson for 21. The game reached a soggy end with the home team on 67-3, one run above the required D/L rate so the win was handed to them.